Originally uploaded by Pretty In Pink Dogs. 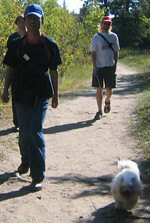 Here is Josie, my husband and our two boarders, Sasha & Hsin-Mo, starting out on our hike through Spirit Sands at the Spruce Wood Provincial Park near Carberry Manitoba. I am behind the camera. After our hike we plan to have a picnic and perhaps do so more hiking.